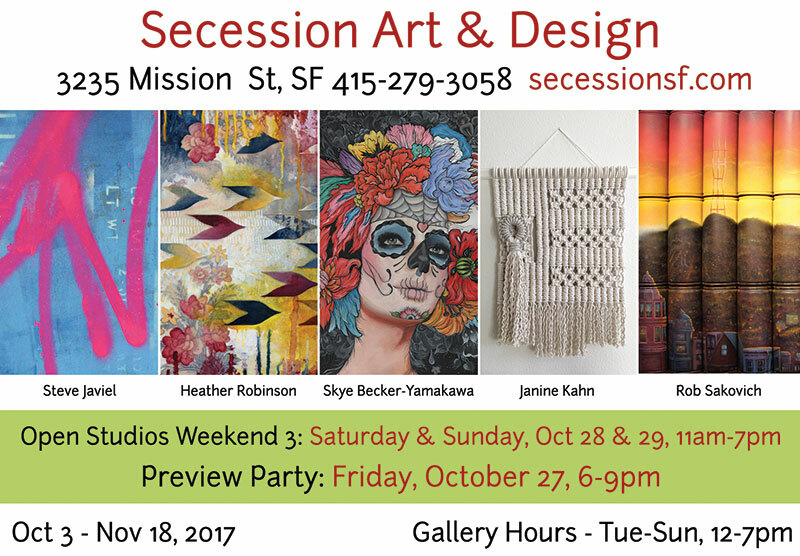 Secession Art & Design welcomes fall with a new art show, Second Skin, featuring Heather Robinson, Janine Kahn, Rob Sakovich, Skye Becker-Yamakawa and Steve Javiel. Through different mediums: acrylic, macrame, spray paint, stencil, and gold leaf, each artists expresses themselves through themes on home, adornment, urban living, and the power of words. Our communities are like a protective shell where we can feel safe, inspired, and active. How does art make you feel? Please join us on Open Studios Weekend 3, October 27-29 to experience this show in person and meet the artists.